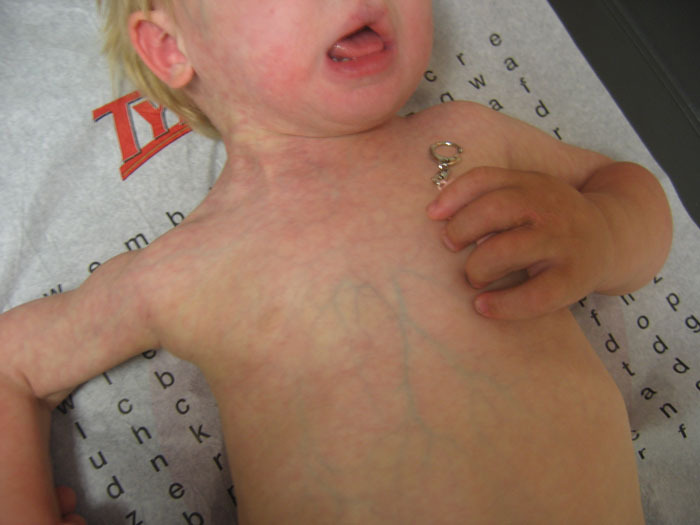 In M-CM, two types of vascular birth marks are commonly encountered. One is a diffuse, vivid and purplish-red discoloration with poorly defined margins in an irregular or patchy distribution throughout the body. This presents in affected newborns and most often resembles a vivid type of cutis marmorata. This very distinctive skin finding is referred to as a capillary malformation. As isolated findings, capillary malformations are very common in normal newborn children. Lay terms used for such facial lesions include "stork's bite" when it occurs on the nape of the neck or "angel kisses" when seen on the forehead or eyelid. They may be referred to by physicians or in the medical literature as "nevus flammeus" or "angiomata." These findings may darken with crying or position changes. In children with M-CM, this type of capillary malformation is often more dramatic and pronounced. As the child ages, the involved region fades to a pinkish-red, and with time the malformations can become even less apparent or be noticeable only when the child is cold or has a fever. Sometimes one side or part of the body may be more affected by these capillary malformations than another. In some children, there is a clear and abrupt demarcation of capillary malformations at the body’s midline. This is evidence that the genetic change that causes M-CM in the individual is mosaic (meaning the genetic change exists in some cells in the body but not others). The capillary malformations in M-CM are sometimes incorrectly referred to as a port wine stain. While a port wine stain is a type of capillary malformation, it gets darker over time while the capillary malformations seen in M-CM fade with time. This skin finding in individuals with M-CM can be an alarming phyisical manifestation of the syndrome, but it in fact does not generally cause any discomfort or medical problems. A few children with a clinical diagnosis of M-CM have been reported who have no observed capillary malformations, suggesting that the vascular appearance of the skin can disappear completely with time in some individuals. It is not known if those reported cases ever had any vascular changes or if it was just a subtle finding at birth that faded with time. The other notable newborn skin finding in M-CM includes a dark red birthmark frequently seen on the midline of the face, philtrum and/or upper lip. This birthmark is considered a midline capillary malformation. It can be mistaken as either a port wine stain or even a hemangioma (a kind of vascular tumor), but these terms would be incorrect as it remains flat and fades over time. When observed, these midline capillary malformations often prompt physicians to consider the diagnosis of M-CM. Other areas of the face that may have these anomalies in M-CM include the lower lip, eyelids, and forehead. For the most part, these facial capillary malformations seem to be only a cosmetic issue despite their alarming appearance and pose no additional health risks. While laser therapy to help reduce their visibility can be considered, the extent and location of the lesions along with the fact that they typically fade over time are all important factors for parents to consider when contemplating this treatment. Early in its discovery, the skin changes of M-CM were felt to represent or closely resemble a condition called CMTC (cutis marmorata telangiectatica congenita) and information on CMTC is often encountered on internet searches for M-CM. In 2007, the name was changed from M-CMTC to M-CM to more accurately reflect the vascular abnormalities of the disorder. CMTC is a rare condition that mainly affects the blood vessels of the skin. It is usually seen at birth or soon after and causes a purple marbling of the skin that looks like cutis marmorata but is much more pronounced. This marbling can be limited to only a certain part of the body or can be distributed over large areas (photo). While individuals with CMTC can have delays in development, they do not have the unique neurological problems or abnormalities of brain development seen in M-CM. In addition, whereas M-CM may have associated overgrowth of affected body parts (hemihyperplasia), CMTC more typically involves undergrowth (hypoplasia) of limbs or body parts affected by the vascular anomaly. While the vivid and diffuse vascular anomalies of M-CM may resemble CMTC, these conditions appear to be separate and distinct entities that have obvious differences and there is no evidence that there is a genetic or clinical association between the two conditions beyond the somewhat similar skin findings. In summary, the vascular and skin findings in M-CM are complex and still quite poorly understood. An accurate description of an individual’s skin findings and vascular anomalies is important in providing appropriate diagnostic clues that will reduce the risk of a misdiagnosis. See more below regarding the vascular findings in M-CM. Vascular malformations are often recognized by parents or doctors as a kind of birthmark. Over the years, terms used to describe certain vascular malformations in individuals with and without M-CM have been inconsistent or occasionally confusing. A better classification system has been created to more accurately define these skin findings. Regarding common vascular anomalies of the skin, there are two types of abnormalities which are commonly encountered in infants: vascular tumors (such as hemangiomas) and vascular malformations. 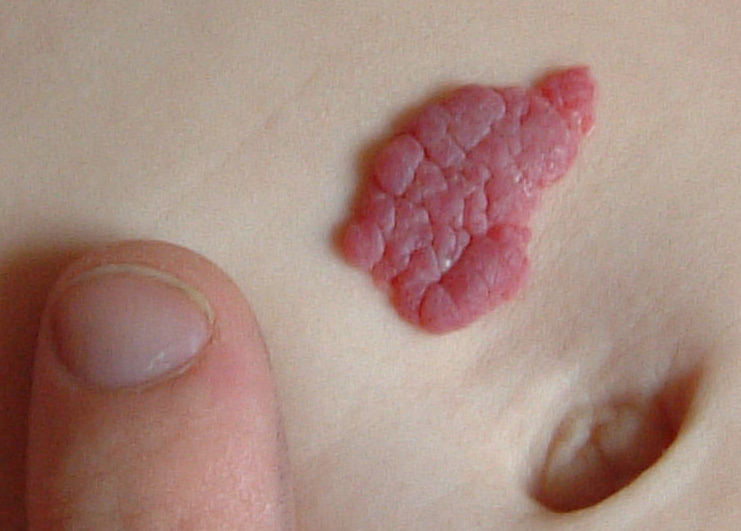 Hemangiomas are benign growths of blood vessels. They may or may not be present at birth, typically grow in infancy, then later often regress. While this type of vascular anomaly may be seen in M-CM, they are not necessarily characteristic of the condition and many children with M-CM do not have true hemangiomas. Some data suggests that there may be a tendency for these vascular growths to occur within the body or other tissues of children with M-CM as they get older, but the natural history of these internal hemangiomas is not well defined and their frequency and consequences in M-CM is poorly understood. In contrast to hemangiomas, vascular malformations are basically collections of abnormally formed blood vessels that exist as localized defects near the surface of the skin. Unlike hemangiomas, vascular malformations are always congenital and present at birth, though they may not be immediately recognized on inspection due to variability in their appearance. These lesions do not grow nor regress but certain types of these malformations can fade in appearance over time. Occasionally, such vascular malformations may be incorrectly referred to as “hemangiomas” even by health care providers, which sometimes leads to confusion when describing these anomalies. Vascular malformations are subdivided into fast-flow and slow-flow lesions depending upon the speed at which blood flows through them. Capillary malformations are a type of slow-flow vascular malformation that affects formation of the capillaries. In general, capillary malformations can be further categorized by their location on the face. Medial (midline) capillary malformations are found along the center or middle of the face.These typically have an appearance of a flat, salmon-pink (or salmon) colored patch. As isolated findings, these are very common in normal newborn children. Lay terms used for such facial lesions include “stork’s bite” when it occurs on the nape of the neck or “angel kisses” when seen on the forehead or eyelid.They may be referred to by physicians or in the medical literature as “nevus flammeus” or “angiomata.” The natural history of these “salmon patches” is that they often fade over time (particularly in the first few years of life), or will at least become less noticeable. Lateral capillary malformations can occur along either side of the face but are not typically found along the midline.These lesions are often darker in color than salmon patches and are considered “port wine stains.”Port wine stains are flat birthmarks filled with tiny blood vessels near the surface of the skin causing a reddish or purplish discoloration. They are typically pink in early life and deepen in color as a child matures. They do not fade or disappear and the area of affected skin grows in proportion to the rest of the body as a child grows. In M-CM, this specific type of capillary malformation is not as common as midline capillary malformations; however, an individual with M-CM can have various types of vascular malformations occurring anywhere on the body. The abnormal vascular malformations that manifest in the skin of individuals with M-CM can also be present deep within the body. Evidence suggests there is an increased risk of malformations of large vessels, such as the arteries or veins that bring blood to and away from the heart. This may correlate with the increased risk of congenital heart defects in this syndrome, since the development of these structures in fetal life is related. Based on case reports, there appears to be an increased risk of strokes or thromboembolic events in individuals with M-CM, although this appears to be in the minority of cases. The literature suggests that these thrombotic events may affect blood vessels either in the brain or in other parts of the body. The exact reason for the increased risk of strokes in M-CM is unclear; it may relate to the abnormally formed blood vessels. Because strokes can cause serious or even life-threatening symptoms, it is important to address any symptoms of concern immediately. Signs and symptoms of a stroke affecting the brain include numbness in the face, arm or leg, confusion or difficulty speaking, unexplained dizziness, blurred vision, loss of balance, difficulty swallowing, headaches or even unconsciousness (similar to many of the symptoms described in brainstem compression). A logical approach to this concern could include prescribing a daily baby aspirin as a preventive therapy (as is done in patients who have risk of thromboembolic strokes for other reasons), however, there is no available information to suggest if this should be done on a routine basis for individuals with M-CM.